We honour and remember our past and current members that are no longer with us. Bob was a long time member of Barrie Thunder Classics, best known for his knowledge of all things flathead. His licence plate was “Flathead”, and we all wondered how he ever got that specialty plate. Always willing to share his experience and knowledge especially on Flathead V8 Ford engines, his 34 three window Ford coupe was not only a pleasure to the hobbyist who really understood cars, but all that surrounded his car when at a cruise night enjoyed not only the view but when Bob opened up you would enjoy a great conversation on the hobby. Following Bob down the road, as many had the pleasure of doing, was a delight to the ears. Nothing sounded better than Bob’s glass packs on his dual exhaust. One of the most delightful stories involving Bob was when he had a good friend over helping with an update on his coupe, the helper called for some absorbent to soak up some spilled oil. Bob soon brought some cat litter that many of us use and when asked broadcast the material under the car where the helper was working. The helper soon realized that it was in fact cat litter and when Bob was asked if it was his reply was “Yes it is cat litter, the kind that clumps up, and I removed all the lumps before using it!!!!!" Needless to say the helper had a good laugh over this as many of us have done since when reminiscing over this story. Bob`s collection was not limited to the 34 coupe, he also had a 1947 Harley Motor Cycle, a 1965 Thunderbird Convertible, a 1932 Model A, a 1953 Monarch 2 DR Sedan, and a 1980 Fleetwood Cadillac. Bob also belonged to the Early Ford V-8 Club of America and the Regional Canadian Group 169, Wasaga Beach Cruisers, and participated whenever he could in cruise nights and annual shows. One memorable show was when he won first in class at the huge Performance World show in Toronto when the trophy was almost as tall as Bob. He received much kidding from his many buddies with good humour. The most significant issue that day was getting the trophy in the coupe. Bob made many friends over the years and benefited from the enthusiasm of many of those friends when he, like many of us, was stymied with an issue. 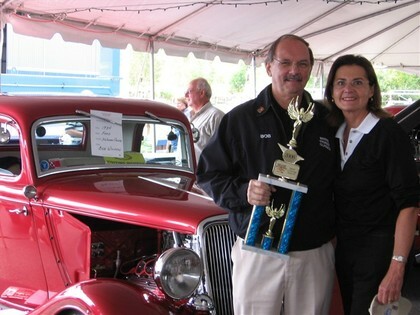 Respected by all, it is sad that we now have to say goodbye to a significant hobbyist in the Classic Car and Hot Rod Hobby. Edie, Bob`s wife, has always been there for Bob, and over the last several months has been his advocate and by his side even as he took his last breath. Our thoughts and prayers go out to Edie and the family as they grieve. We all recognize that Bob had a great ride while with us in his 34 Ford five window coupe!!!! !